Been fighting this lean idle and misfire the last 6 months. This isnt my first time with ka-t, had a stock motor pushed 10psi on corn till one day it started knocking and bent two rods. Motor had about 160-200k miles. No biggie, go through a tear down, get a bunch of parts. Did a standard motor build with wiseco/manley setup bored out, crank balanced/polish, cometic HG with the head/block decked. Head was cleaned up with new guides/valve stem seals. Running RS rom tune, Martin is a legend! 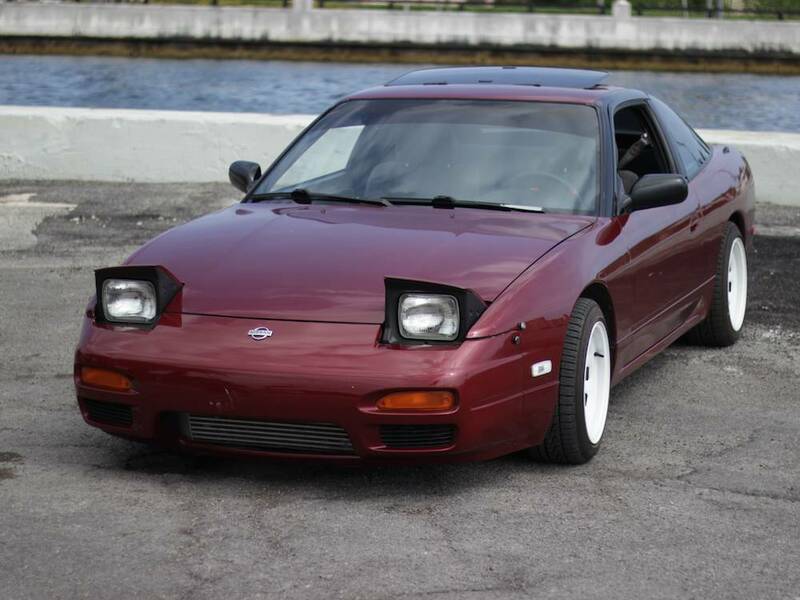 Have z32 maf and 1000cc injectors with precision t3 entry level turbo, tial wastegate, hks bov blah blah blah. Issue is on start, basically cold the car would run seriously lean and stall out. I got it to idle now messing with the throttle plate and IACV screw but its reading --- on my wideband. Basically 17+ afrs. Now list of things i've tried and swapped out. -Brand new iacv, had an early ka so had the single jingle connector and wouldnt fit my WS harness. - Vaccum tested/smoke tested about a million times. Holds 10-15psi like nothing. Did find a light leak on my ACC, the long skinny under the intake runners. Only see it because of bubbles from soapy water. - New cap for dizzy and NGK spark leads. - Swapped a buddies dizzy and set up timing and no change. - Brand new bosch o2 sensor s14 style. Its a 3 wire and fits the WS harness. - five0 1000cc sidefeeds new (yes I know go topfeed) swapped those into my buddies car and loaded a stock rom tune with a regular resize and car idle perfect. I bought a moates chip burner and got a copy of nistune. -Compression was goodish. I had 150 across besides cylinder 3 which was 120. Had similar compression on my stock motor and turns out my exhaust valve was leaking, was kinda warped along with one in 1st cylinder. No problem, got new BC valves, took off the head and my machinist swapped it in and redid the lash. Thought it was my fix but started the exact same. Check compression and leak down again. All checks out fine. -Tried 3 different ecus, tried my old 720cc injectors and my buddies stock injectors. Same issue. Checked brake booster line check valve, not leaking. -PCV system is VTA to a baffled can, doubt an open fitting on block pcv port will cause it to run lean. -Did timing a million times, at 20 with light and Nissan datascan and checks out in pictures. Will post later. - replaced old e85 in the tank with fresh corn. Replaced that with 93 as of last week. -Fuel pump is a walbro 255, works fine just super loud will replace soon. Swapped in a buddies one and no change. -New tomei FPR, fuel pressure changes on idle because of how lean it is and terrible vaccum but on key its dead at 3 bar (43psi) was maybe thinking air in the system???? Is it possible to have correct fuel pressure but air in the system? https://www.youtube.com/watch?v=qBbVtNIp5iQ the normal startup, gets worse when bringing the idle screw down and messing with the little nut for the throttle plate. https://www.youtube.com/watch?v=tvrT4-q70Tg injector latency was pretty low at 650ms on the tune. Bumped it up to 800 and even a 1000 in the video and no change. https://www.youtube.com/watch?v=YFSLPaKEZvM stock tune with resize/maf change. When I compared the tunes besides tables and k value the only difference was some cold start start up settings and TTPMIN/TTPMax settings. Trail and error I found it was the TTPMIN setting basically forcing the injectors to dump more fuel. It leans out right away with light tap or on cruise. https://www.youtube.com/watch?v=ehZMTwI_LPQ This is what its like right now with the new valves sealing and 93 in the tank. 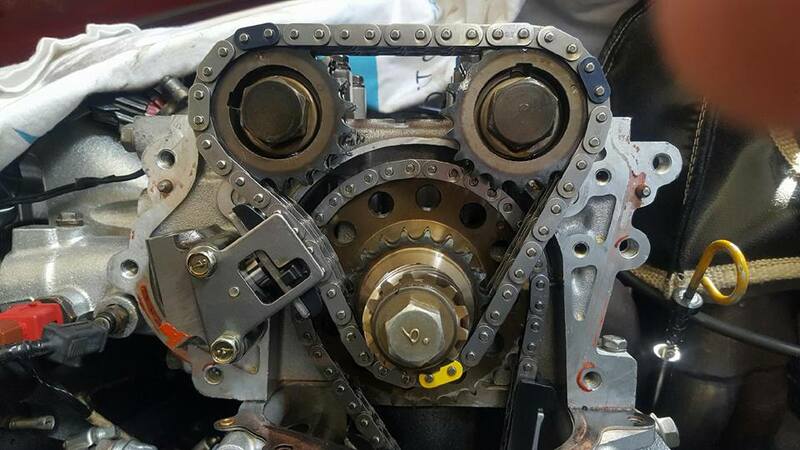 With 02 on it dies out, without it and opening the throttle a bit and adjusting tps/ idle scew it can idle 1000-1500 easy but still lean and misfires. So, What fuel are you running again? You said you were originally running E85? Also, what is the latency value you are running? Can you post a copy of your tune? I can post about 6 different tunes lol. I have 93 in the tank right now. Originally had e85 but dumped it out because was sitting for basically months. I should say Martin did the switch for my ecu to do the dual tunes. So I have both pump/e85. Both tunes are basically same but e85 k value and some startup settings are different for obvious reasons. I remember holding revs on e85 with k value same as stock and it wouldnt come close to stoich. Still lean out past 17+ on my wideband. Its on my other computer but for my latency off my sheet it was 650ish @14v which is what im getting at every injector running. I tried with e85 from 650 to high at 1200. With pump tune im sure its like 675 since thats pretty standard and ball park when Martin does his tunes. Besides latency and k value change it still runs lean. Maybe I have a preignition issue or bad spray? My spark plugs are burning black and should be burning super lean/white at least from what the wideband is reading and engine missing? Going to swap over another fuel rail and see. What does your ecu say is happening? You say the wideband says lean, but the plugs are black? 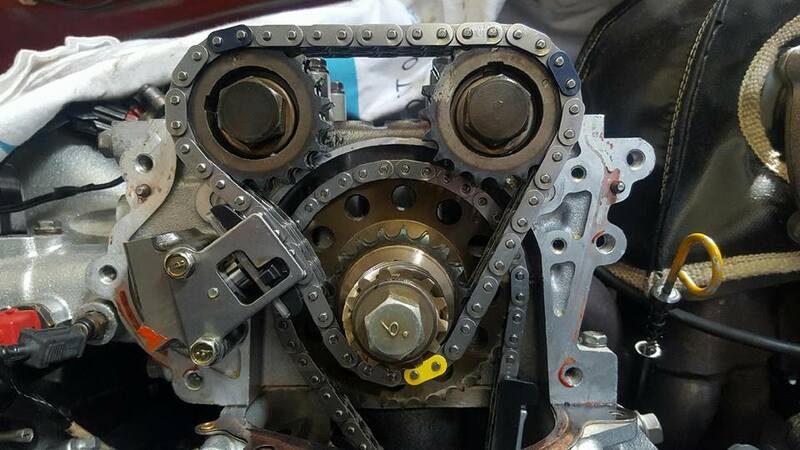 Are you 100% sure your cam/ignition timing is correct? Do you have your own o2 sensor hooked up? Go ahead and post athe current tunes you are running. Have you do a free air calibration on your wide band lately? 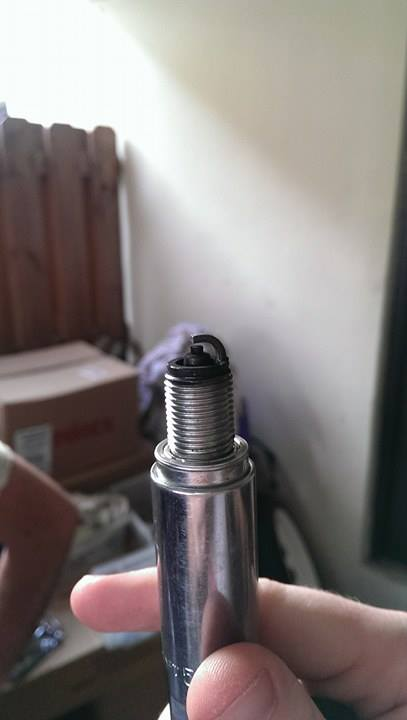 The whole black spark plugs thing is interesting now. These are brand new and my second set and they look like they have been running stupid rich. I disconnected the maf and started it maybe one or two times to check something but that shouldnt make it look like that so quick. One thing I noticed which is strange is if I manually set the car temp in nistune/nissandatascan the afrs start to richen up loads and will idle in the 15s. I tried swapping in my old CTS and no change thinking it was that. Also when I switch on my fasn it idles some what better but still lean. Without messing with tempature with the fans on cold it will richen up to 17s on my wideband instead of no reading like "---"
Does it do this with new spark plugs? You say you have Nistune now? Can you post some data logs of it doing this? I've got a "copy" of nistune but I can def do some logging tomorrow since im off work. Will get new spark plugs to check. The ones in the pictures are my second set. First set looked the same, swapped in the new set because I threw in my old 720cc injectors and motor got flooded because number 4 was stuck open. Was an oring and got all the fuel out, swapped in these ones and started it with the 720cc and started the exact same. Started it again with the 1000cc and when I took them out again was when I took off the head to get new valves. They looked exactly like the picture and since getting the head on started it a few times to finally get it to idle and took them out again for interest sake. Is it possible that preignition can cause a lean 02 but burn rich? Im second guessing my timing but it looks right. Could I be off on my lower chain? Your cam timing looks right, but it's hard to say 100% without seeing more of the lower chain. 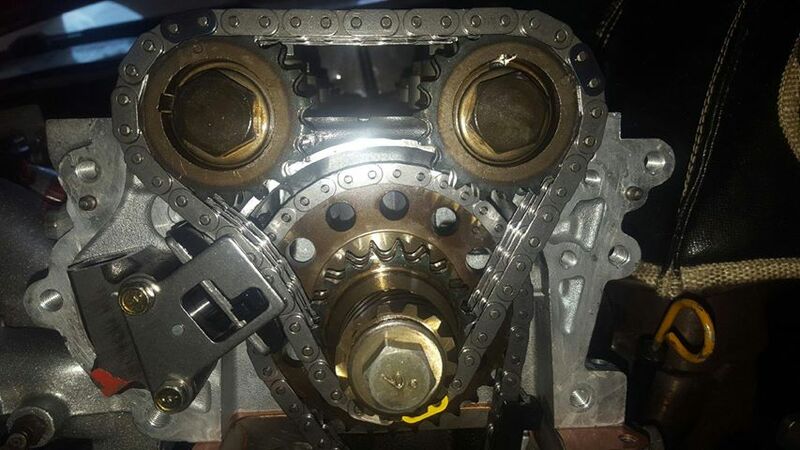 It might be a good idea to check cam timing again just to be sure. The reason I asked about the plugs, is that a 7 heat range plug will foul a lot quicker if not run hard than a 6 or even 5 heat range would. I experienced this with copper NGKs when I first got my motor running. I was only running 8-12 psi. After fouling several sets, a friend talked me into getting NGK iridium plugs and they are fantastic. They are not cheap, but when you consider how much longer they will last, it's worth it. Noticed my lower timing... It should be around 5 links from the mark on the sprocket to the top of the guide right? Should be about exactly half a link like this picture. You can kinda see it not being like this the picture I posted above. On my timing the link is slightly below half the link. When I move the crank to 5 BTDC the link is dead in the middle by the guide and looks right. Its so slight... I can take some pictures this weekend. Going to move it over, if I had it right before it shouldnt run/start if my timing is wrong this should run fine. It could explain why im thinking its preignition and also when I removed my head my pistons where pretty black, almost like carbon build up. If my ignition is lets say 5 degrees out then that would explain my lean issue and pistons. Hopefully that makes sense and seems logically at this point since i've check everything electrically. If you pause on these videos you can see what im talking about. I could have jumped a tooth in assembly, I know its possible if you dont keep that right short side of the chain tight. Is my lower timing off? AFAIK the idle sprocket dot should be five links from the guide on the right. On the fith link should be in the middle. First picture is at TDC, second is 5BTDC, and third is a picture from a thread fixing incorrect lower timing without taking off the front cover. Cam timing looks perfect. It looks to me like it may be off. The only way I know to verify 100% is with a dial indicator and degree wheel. What about counting links on the lower chain between the dot on the lower sprocket (crank) and the one on the upper sprocket? I would check the rest of the lower chain but thats such a pita..... Im going to try move it one over and start it up. It could only run worse and I doubt it would do anything to the motor if it doesnt run any better after 10 seconds of idling. So its either tune/ecu which i've ruled out tune at this point. Swapped in a buddy ecu with moates board I put in and car ran the same with just a normal basetune. Could be maf? Unlikely since i've swapped in a second maf and im getting proper voltage etc. Going to just ride the car stock with all my turbo stuff hooked up lol, it hilarious but its been over a year and till I hear back from the injectors then i'll go from there. Im so close to get it where I want it! 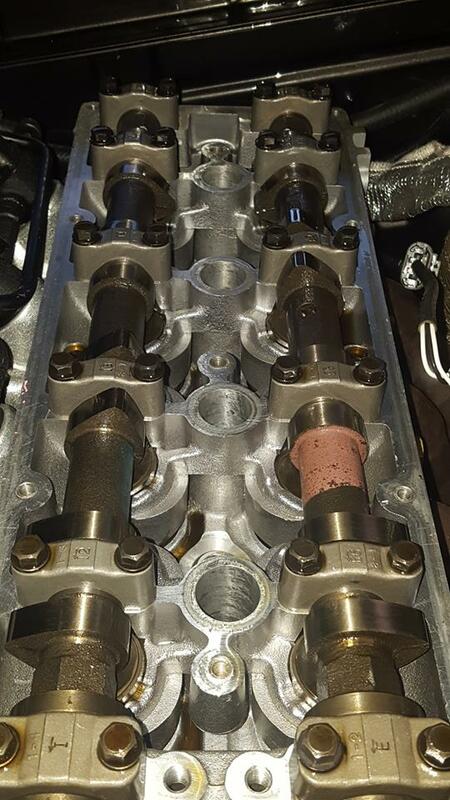 You have the five0 550cc side feed injectors? I am running them and I'm getting 16.5 or so at idle plus my oil smells like gas. I pulled the rail and primed the system but no leaks (o rings are good). How did you test running the injectors for proper operation?